NES Kid Icarus (USA/Europe) in 21:05.75 by Randil & Alyosha. 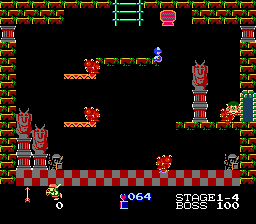 Kid Icarus is a classic NES platformer where the player is Pit the angel who is on a quest to defeat Medusa. This is an improvement of 1:11.63 over the previous movie, thanks to glitches which allow zips. See the author's comments for details.